Virtual World Best Practices in Education April 2019. 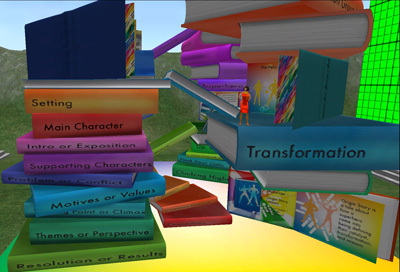 Virtual Worlds Best Practices in Education Conference 2015 - I did a lecture on “Learning by Leading – Discover Your Destiny”, a poster exhibition called “Courage to Encourage – Origin Story Lessons”, and two panels called “Content Curation Through Virtual World Communities” and “Nonprofit Commons: Lowering Entry Barriers into Virtual Worlds for Non-profit Organizations”. 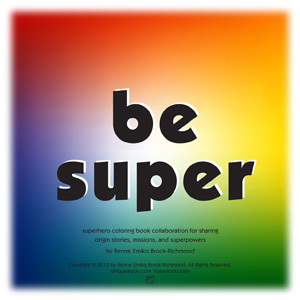 Did you color about your superhero origin story in my new coloring book, "be super"? 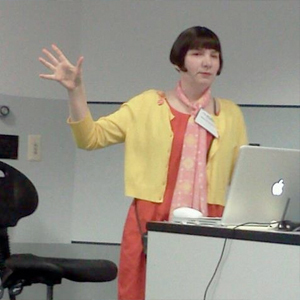 Presenting Authentic Avatar – Inspiring Trust with Your Virtual Identity for Federal Consortium for Virtual Worlds Conference National Defense University in Washington D.C. May 2012. Please see the slideshow at the bottom of this page. 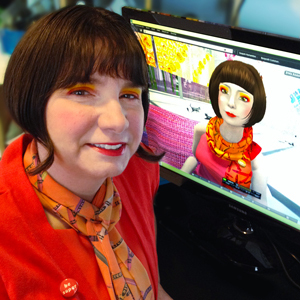 Here I am with my avatar Zinnia Zauber. Please note we are wearing the same scarf and affordable art! Video of Share the Black Crayon - Collaborative Superhero Teams, no audio, please see the PDF Transcript. Want to learn more about immersive environments? Authentic Avatar – Inspiring Trust with Your Virtual Identity for Federal Consortium for Virtual Worlds Conference at the National Defense University 2012.